Surfer Life Podcasts interviewed PaddleAir founder, Dave Hilts about the Ergo at the recent Surf Expo 2015 in Orlando, Florida. You can listen to the podcast on the Surfer Life website here. Or, get it from Apple's iTunes and listen on the go. Dave's interview begins about 10.5 minutes into the 45 minute podcast, but the entire recording is worth a listen. Surfer Life Podcast is an online resource whose "goal is to bring to life the voice of all surfers." You can find them at SurferLife.com, Facebook, Instagram, iTunes, or subscribe to their RSS feeds. 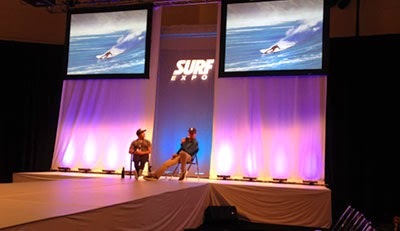 Surf Expo is "The longest running and largest boardsports and beach/resort lifestyle tradeshow in the world." PaddleAir, based in California, made its premier appearance at the January 2015 show in Orlando. PaddleAir was founded in 2004.